COLUMBIA — After seeing a flier for the Creating Original Music Project in high school, Ben Colagiovanni entered the competition and won. "Without that contest it never would have occurred to me to pursue music in college," said Colagiovanni, whose original plan had been to major in history. 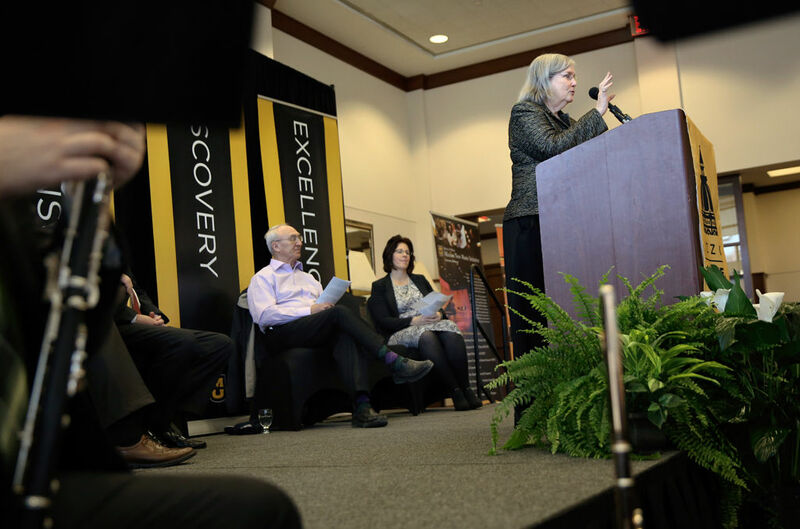 Now a senior at MU, he was among those present at an announcement Monday that Jeanne and Rex Sinquefield are pledging to give $2 million over three years to the MU School of Music for the Mizzou New Music Initiative. The initiative, which is funded by the Sinquefield Charitable Foundation, supports the Mizzou International Composers Festival, Mizzou New Music Ensemble, several competitions and scholarships for MU music composition students as well as opportunities to meet other composers. The Creating Original Music Project encourages Missouri K-12 students to compose new music. After winning the competition, Colagiovanni said he realized, "Maybe I could have a future in music." Colagiovanni said he's thankful for the Sinquefields because they helped give him the opportunity to study music and composition at MU. He said he's a Sinquefield scholar and has a full-tuition scholarship through the Mizzou New Music Initiative. After the announcement at the Reynolds Alumni Center, an ensemble performed Colagiovanni's "Forest Park Rhapsody," for which he recently won the Young Artist award in the Music Teachers National Association composition competition. In April, the Sinquefields pledged $10 million in seed money for a new building for the School of Music; fundraising is still underway. They gave an initial gift of $1 million in 2009 for music composition and another $1.4 million in 2013. Jeanne Sinquefield said she chose to donate to the MU School of Music after encouragement from former MU chancellors Richard Wallace and Brady Deaton. All three of her children also attended MU. A string bass player for more than 50 years, Sinquefield said she chose to support music composition at MU because writing new music fascinates her. "I always just thought it was magical that someone could write a piece of music," she said.